I may have mentioned it once or twice already, but I'll recap (after all, we have new readers coming in every other blue moon): After two years of working on Gunk Haus we have not found any notable treasures or monies (except for pocket change; does anyone know what a 1943 penny is worth), dead bodies, or drugs. The only notable find ever was an adult entertainment magazine (circa 1970s, when hair was still in and acceptable). But we haven't give up. Buried somewhere must be a secret stash of Washingtons, or, God forbid, Lincolns. 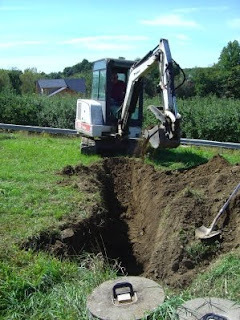 So under the disguise of having to install a new septic system we brought in heavy equipment to tear up the ground. First thing in the morning we took the metal detector out into the field, and we got lucky. From the sound of the metal detector, there was a lot of stuff in the ground. 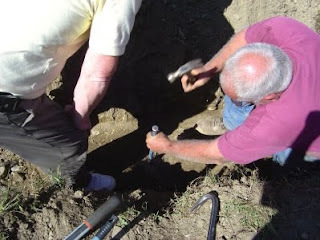 So we dug it out, and found the casing of our old well. I admit, we didn't really look for it, it was sticking out of the ground, but we were only practicing. But as we had excavated it already, we cut off as much as we could (might as well, you get 8 cents a pound at the junk yard). Next we dug around the existing leach field, a prime burial ground for dead bodies, like ancient Inkas, they always have gold in their graves. And we got lucky!!! We found an underground vault, and the gang went wild. 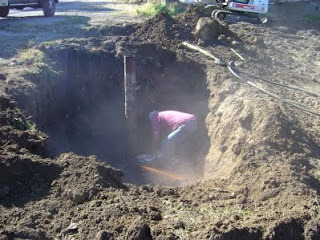 Unfortunately it turned out to be part of the septic system. Oh well. At the end of the day the yard was torn up, and we hadn't found anything. Maybe I'll cash in the scrap metal we found at the junk yard tomorrow, a buck or two here and there certainly adds up. 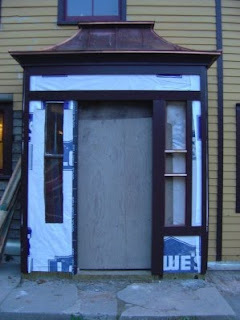 Work (I think that's what this blog is all about) on the main entrance is coming along. It is taking a little longer than I hoped for, but it will be fantastic. Wow! It is really pleasure to read your blog author! These ideas are very awesome and I will try to follow all these. I also gather some knowledge from my most favorite online site on Things to do Sunshine Coast .